Last year, I posted maps showing how each poll voted in the 2011 and 2013/2014 by-elections in two key Downtown Toronto federal constituencies: Trinity-Spadina, and Toronto Centre. I also provided some thoughts about the races and the candidates. Now, over six months since the October 2015 election, I took some time to look at what happened. 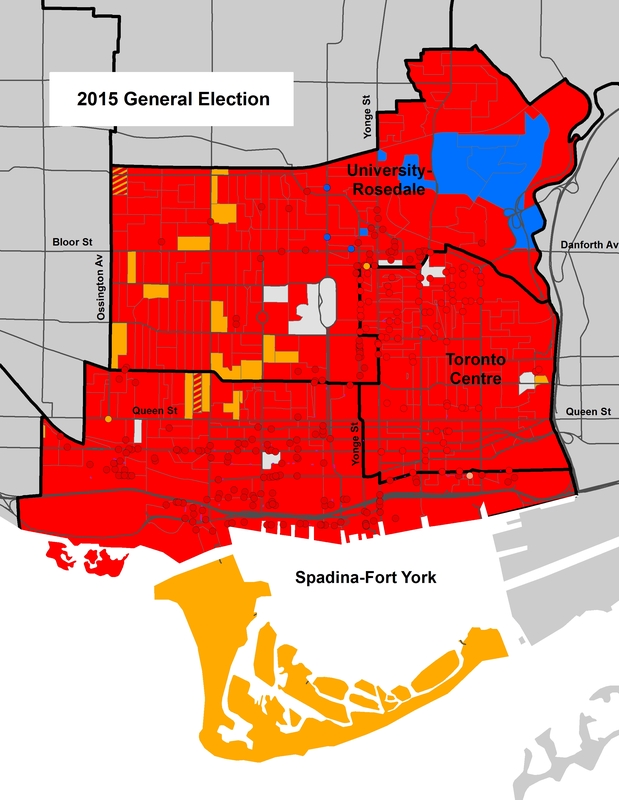 In the 2015 federal election, these two ridings were split into three: University-Rosedale, Spadina-Fort York, and a much smaller Toronto Centre. In 2015, all three ridings were ones to watch; all three had high profile Liberal and New Democratic candidates vying to a seat in Parliament. In my previous posts, I expected close races. In 2011, Olivia Chow won handily in the 2008 election, and won in a landslide in 2011, in which the second-place Liberals fell to third after a terrible campaign led by Michael Ignatieff and the “Orange Crush” in Quebec, where the NDP took a majority of seats in La Belle Province. The Liberals’ Bob Rae held on in Toronto Centre, but resigned in 2013. In a by-election in 2013, Chrystia Freeland kept the old Toronto Centre for the Liberals, but NDP challenger Linda McQuaig managed to increase the NDP’s vote share to 36.3%, a historic high. I expected that the NDP would be more competitive in 2015, once Toronto Centre lost the affluent Yorkville and Rosedale neighbourhoods with the new riding boundaries. In 2014, Olivia Chow resigned to run for Mayor of Toronto. Chow, who led opinion polls in April and May, went on to come in a disappointing third place to John Tory and Doug Ford. To fill Chow’s vacated seat, outspoken and popular local councillor Adam Vaughan ran for the Liberals; with 53.6% of the vote, Vaughan took back a seat for the Liberals lost to Chow in 2006. The NDP candidate, Joe Cressy (who took 34.1% of the vote in the by-election), won Vaughan’s old council seat in the 2014 municipal election. I predicted that each race would be tight, thinking that the resurgent Liberals, backed by a charismatic Justin Trudeau, would take at least one of the three new ridings, most likely Spadina-Fort York, where Adam Vaughan ran for re-election. The NDP’s Olivia Chow won that party’s nomination in that riding, but after losing the mayoral election and then taking a teaching position at Ryerson University, I thought it was a mistake on her part. I expected things to be different in University-Rosedale and Toronto Centre. Linda McQuaig ran again in Toronto Centre (full disclosure, I supported her campaign), and with Rosedale and Yorkville gone, I figured that the NDP had a good chance of finally taking that seat, especially against a first-time Liberal candidate. The Liberal candidate was Bill Morneau, who had solid business credentials (he was the head of the business think-tank C.D. Howe Institute), but, in my own view, he too right-wing for Toronto’s Downtown East Side; previous Liberals that represented that seat include Bob Rae and Bill Graham. I also felt that the NDP’s Jennifer Hollett had a very good chance in University-Rosedale against the Liberals’ Chrystia Freeland, who decided to run for re-election in that seat instead of the new Toronto Centre. As the map below illustrates, the Liberals swept all three local races, doing exceptionally well in Toronto Centre, but also winning a majority of votes in Spadina-Fort York and 49.8% of the votes in University-Rosedale. The NDP came in first place in 32 of 687 election-day polls, tying with the Liberals in just three others. The Conservatives came in first place in 10 polls, all in Rosedale or swanky Yorkville condo towers. Maps at the bottom of this post show how the results on the 2011 general election and the 2013/2014 by-elections compare. How did Downtown Toronto turn nearly completely red? There was certainly a desire for change after nine years of government led by Stephen Harper’s Conservatives, and both the NDP and the Liberals were hoping to be the party of change. Thomas Mulcair was a very effective Leader of Her Majesty’s Loyal Opposition, grilling the Conservatives at every opportunity. But Mulcair turned out to be a poor party leader when it came to election time. He dropped the “Angry Tom” personality that worked so well in Question Period, but his new demeanor didn’t feel convincing; he did not have Jack Layton’s charisma that worked so well for the NDP in 2011. The campaign, bereft of bold ideas and with policies too similar to the Liberals, was lacking. The NDP’s brave stance on religious freedoms in Quebec didn’t help either; the polls saw the NDP losing popularity right across the country. Also, Liberals who sat out the 2011 election, possibly due to a dislike of Ignatieff, came back in 2015. While Mulcair was busy in Ottawa, Justin Trudeau, elected to the Liberal leadership in 2013, was busy rebuilding the party and its finances. He barely showed up to the House of Commons, but in the long run, it worked. The Liberals had a better campaign, even running to the left of the NDP on some fiscal matters. While I supported my local NDP candidate, I was left disillusioned by the federal campaign and Mulcair. There were certainly parallels to the 2014 municipal campaign, where Olivia Chow ran an overly cautious, front runner campaign with few exciting ideas. John Tory had a slicker campaign, run by the same man that got Rob Ford elected in 2010. Progressive and centrist voters, looking to get rid of the Fords, ended up backing Tory as he had the best shot in October. In 2015, NDP promised immediate balanced budgets; the Liberals promised federal spending and several years of deficits to boost the economy. And centrist and progressive voters, looking to be rid of the Conservatives, followed the polls and picked the best shot of defeating Harper. For the first time since the Jean Chrétien era, the Liberals swept Toronto and the inner 905 municipalities such as Brampton, Mississauga, and Vaughan. Not only did the Liberals do very well downtown, elsewhere in Toronto, excellent NDP MPs fell to the Liberal sweep, including as Peggy Nash and Andrew Cash. In Davenport, Cash received almost as many votes as he did in 2011, but Liberals came back to the polls in droves and helped to elect Liberal insider Julie Dzerowicz. Downtown, Chrystia Freeland and Bill Morneau were appointed to cabinet. In the end, though, we got rid of one of Canada’s worst Prime Ministers, and elected a (so-far) progressive Liberal government that has already done some work to undo Harper’s legacy. Canada made a decisive decision on October 19, 2015, and I’m glad for a clean and fair result. As I write this, there’s nothing that has caused me to oppose the new Liberal government, though I’m concerned about their commitment to electoral reform. Meanwhile, the New Democrats will take some time out in the political wilderness, regroup, select a new leader, and hopefully come up with an inspiring and thoughtful platform by 2019. Here are the maps of the 2011 and 2013/2014 by-elections to compare with the results of the 2015 general election. This entry was posted in Election, Politics, Toronto and tagged 2015 Election, Spadina-Fort York, Toronto Centre, University-Rosedale. Bookmark the permalink.